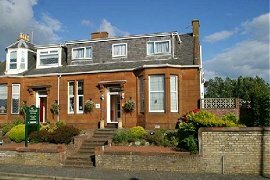 Fernbank Guest House is only 1 mile (1.5km) from Glasgow Prestwick International Airport. It is ideally placed for all of the amenities offered both in Prestwick, Ayr and Troon, as well as those to be enjoyed throughout the local area. Fernbank is particularly well positioned for the sea front, the swimming pool, the indoor and outdoor bowling greens, the tennis centre and of course the numerous nearby Golf Courses. Local courses include the championship courses at Old Prestwick, Royal Troon and Turnberry, as well as the other excellent courses at Belleisle, Troon (3), Gailes (3) and Prestwick(2). Tee times can be arranged on request for a small admin fee. We are also able to offer discounted golf packages on several local courses. We can also provide secure storage for your golf equipment. 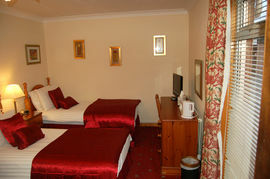 All rooms have in-room shower/WC, TV, alarm/radio, coffee/tea and hairdryer. The showers are all high pressure. 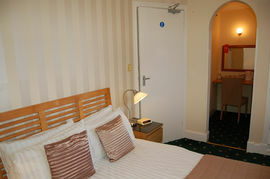 Wi-Fi Internet access is available on request, as are fax facilities (a small charge applies). Off-road parking is available. There are a surprising number of excellent places to eat out in Prestwick, Troon, Ayr and the surrounding villages. If you need any advice, please ask either Linda or David. Room packs contain menus. Some discounts have been arranged locally. Other local activities include visiting the many Robert Burns attractions, Culzean Castle and country park and the spectacular Galloway Forest Park where both hill-walking and cycling are well supported. 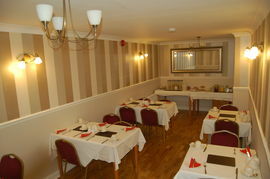 Breakfast is served at individual tables in a delightful dining room. It consists of cereals, juice, fruit and yoghurt which are self serve, tea and coffee and a plentiful, traditional cooked breakfast. Vegetarian and / or non cooked options are available by prior arrangement. David and Linda look forward to meeting you and to giving you a hearty Scottish welcome at Fernbank Guest House. Arrive as a guest, depart as Friends. Fibre Optic Wi-Fi Internet access. Special Diets Provision: Special diets are catered for. As required by prior request. From PIK, take the A79 to Prestwick (left out of Airport). Turn right at roundabout into Prestwick. Drive for about 1 Km until you see a white building on your right - The Golf Inn. Take the next left (Bellevue Road) and then turn right into my car park. A taxi costs around £3 and the walk is 15 minutes. Walk through the car park and up the slight hill. Turn right at the main road and walk for 700m. We are on the left of the Street at the junction of Main Street and Bellevue Road. From GIA, take the M8 to Glasgow. Follow the signs for M77 Kilmarnock/Prestwick Airport (PIK). From PIK, take the 3rd exit to Prestwick town at the roundabout. Proceed through town for about 1/2 mile. Pass Golf Inn on your right (a low, white cottage-style pub) and take next left up Bellevue Road. Turn right almost immediately into our car park. 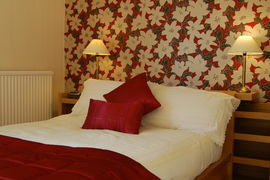 £30.00 to £39.00 Pounds per person per night on a B&B basis, depending on room type and occupancy Discounts for 3+ nights. Open all year except 22 December to 4 January (approx). TripAdvisor Certificate of Excellence: Green Champions GOLD Award.